Write-in candidates are also an option. Follow this Link to submit your vote! Now that registration for the Summer 2015 and Fall 2015 terms has begun, I would like to remind you of several matters you should take into consideration as you select your courses. The logistical information found on Course LookUp is always accurate but these listings only include the catalog copy rather than more current information on the current version of any course. We will endeavor to insure that course descriptions appear for all graduate courses. Second, graduate students interested in creative writing should be aware that, in response to concerns from the UT System and our accrediting agency, we are reducing the number of times creative writing courses can be taken. Effective Fall 2015, introductory-level graduate courses (HUAS 6350-6355) may now be taken only two times each. Student who have taken these courses the maximum number of times should then enroll in intermediate-level graduate courses (HUAS 6380, 81, 83, + 85). These courses can also only be taken two times each. We will offer intermediate courses each long semester beginning this Fall. We will also continue to offer HUAS 7349 regularly for doctoral students. This new policy does not affect any courses in creative writing that you have already completed. It only restricts the number of times you can take each course number beginning with the Fall 2015 semester. 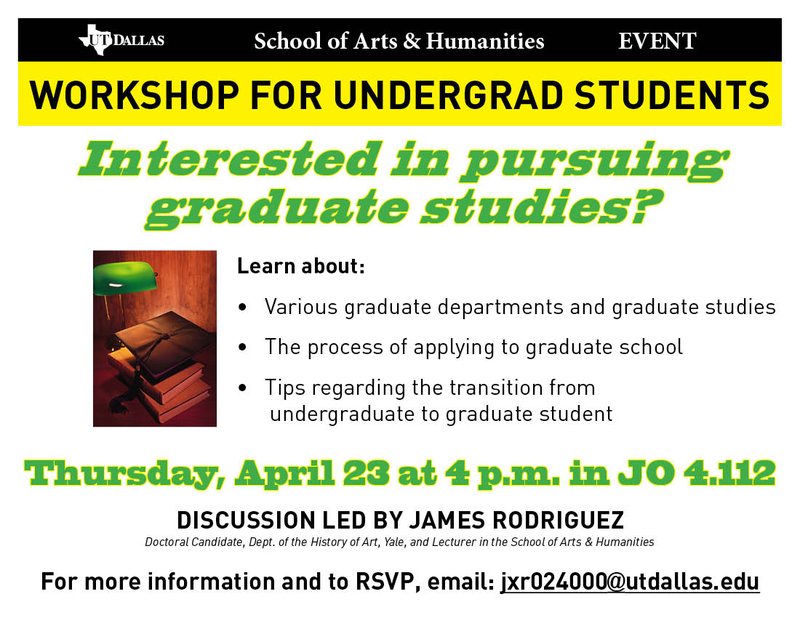 Finally, I’d like to remind all doctoral students that, effective Spring 2015, repeatable organized courses are counted toward your graduate career at UT-Dallas as a whole. That is, if you take a course number the maximum number of times listed in the catalog as part of your MA degree plan, you will be unable to count the course number as part of your PhD coursework. Similarly, if a course is repeatable to 9 hours total and you take it once during your MA, you will only be able to enroll in it for 6 hours as part of your PhD. Our assumption is that, if in earlier course work you have exceeded the maximum number of repeats, those courses will be allowed to be applied to your degree plan. Any courses taken from Spring 2015 forward, however, must not exceed the maximum hours listed in the catalog for your entire graduate career at UT-Dallas. Doctoral students should also refer to their copy of the milestones agreement which outlines the requisite steps to complete their degree.